What does "average" and "above average" donor look like? can anybody provide clear photos of what a good example of “average” as well as “above average” donor looks like? i think i was told i had an average donor at one point, but what makes an “above average” donor? » well as “above average” donor looks like? Redman, to have a real evaluation of your donor density and how many grafts can be safely harvested, you really need to see a doctor in person. This is a good question and is not just a simple answer. Most would say it is just down to density per cm2 but it goes deeper than that. Other aspects such as hair calibre, number of hairs per follicular unit average, spacing between each follicular unit and also the amount of miniaturisation if any in the donor are all very important aspects to consider when assessing the donor area for suitability. As a general around 75 FU cm2 is considered to be about average from a numerical calculation aspect but then add in for example the average number of hairs per natural group and an average donor could become below average. Let’s say the average hair count was around 2 hairs per FU, around the occipital especially we find many 3 and 4 hair groups, this would then be low. This is quite a good example how approx same density areas can display different hair characteristics, from poor to average to very good, just because the hair numbers per FU have increased. » donor area for suitability. » of hairs per natural group and an average donor could become below average. » because the hair numbers per FU have increased. hi stephani, that helps a lot. so in your examples “C” would be considered a lower density simply because more than one follicle is grouped together during the extraction versus single hairs? is that correct? Not too sure if I understand you correctly, but here is what I meant by the picture; I’ll go into greater detail later and try to edit the picture to explain better. “C” has a higher concentration of hairs per natural FU group compared to “A” and “B”; the density of FU in each picture is about the same that is just the calculation of FU’s in an area but the hair count is significantly better in “C”. This means “C” is a much better donor to harvest from than the other two examples, the person will get more hair from “C”, even though the same amount of follicular units are removed. So for the sake of example, if both donors were harvested and 2000 grafts/FU were taken and they were placed over the same surface area, “C” would be thicker coverage than “A” would, or alternatively “C” could be distributed over a slightly larger surface area and still maintain a good thickness because more hairs are available. Blackjak, the above photos is of my donor after 6,400 FUE harvested and not my original density that was much better than average. » the same amount of follicular units are removed. » thickness because more hairs are available. » not my original density that was much better than average. oh ok i had it backwards i understand now. if you factor in curly hair (which i have) how is that better and requires less grafts to get the same result as straight hair? i’ve been told that by the two HT docs i’ve done online hair consults with. Stephen has covered most of the points. However, I would like to point out that racial features too make a lot of difference. For example, most Orientals and negroid individuals do not have even 60 FU per sq cms. The average in them would be around 40 to 50 FU per sq cms. Average FU density for most people from southern parts of India and S.E. Asia is around 60 FU per sq cms. Average density in people from Northern parts of India, West Asia is higher (nearing 70 FU per sq cms). Those from the scandinavian coutries, especially those with blonde hair have the highest FU density (sometimes nearing 90 to 100 FUs per sq cm). However, it seems nature compensates. Those races with higher FU grafts/sq cm usually have much thinner calibre hair, then those with less FU grafts per sq cm. The hair shaft diameter in a person of Korean descent, for example, is usually 2 to 3 times that of a blonde caucasian. When considering “averages” one must keep this consideration in mind. » » well as “above average” donor looks like? » » “above average” donor? » Stephen has covered most of the points. » per sq cms. The average in them would be around 40 to 50 FU per sq cms. » Average FU density for most people from southern parts of India and S.E. » parts of India, West Asia is higher (nearing 70 FU per sq cms). » have the highest FU density (sometimes nearing 90 to 100 FUs per sq cm). » usually 2 to 3 times that of a blonde caucasian. » When considering “averages” one must keep this consideration in mind. hi dr a thanks for the response. i’ve read african american hair characteristics allow them to require less grafts because of the hair being naturally curly is this true in your experience? can you give example? do people from india get better coverage being that they have darker skin AND averaging around 70 fu per sq cm? This is a great thread. 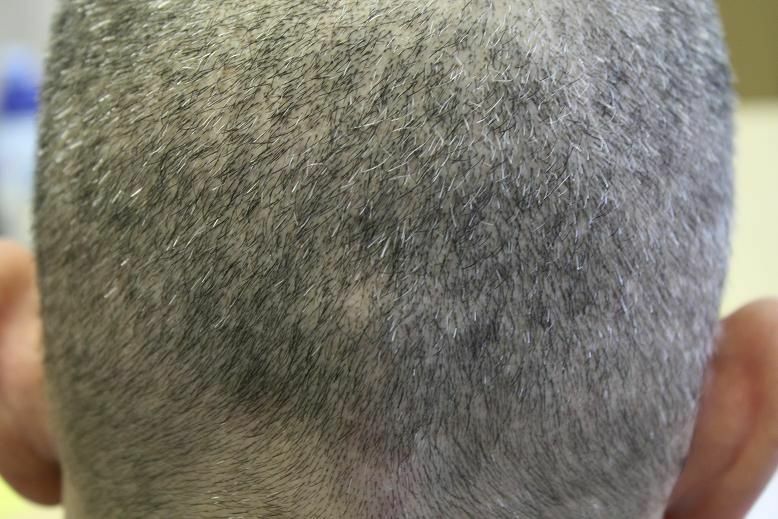 In photo C the patient has a very high number of triple follicles. So if you take 4 grafts that is going to be 12 hairs. Versus 4 follicles from patient A will yield 4-5 hairs. Patient C will get much better coverage! As Dr. Arvind explained, another thing to take in to consideration is hair shaft density. stephenl, based on the photos you posted, 1 FU can have many individual hair follicles, can you confirm? 1 hair follicle equals 1 hair. curly hair does have advantages as the curl can create a greater illusion of fullness, it can sometimes though look thinner if the hair is shorter though, nothing’s never a win win with HT I’m afraid. A follicle is one hair as such, in the scalp connected to the cardio vascular supply, with muscles, nerves, sweat and oil gland connected. An FU or Follicular Unit is a group of follicles situated in a group or bunch if you like, normally containing 2 to 4 hairs or follicles. For ease most will just say FU can have 1 to 4 hairs. When most clinics say grafts they mean the same thing also, although some may differentiate and it’s important for you to qualify what a graft is. For example big difference getting 2000 grafts if they are all single hairs opposed to 2000 grafts/FU with an average of over 2 hairs per FU; over double the hair numbers.